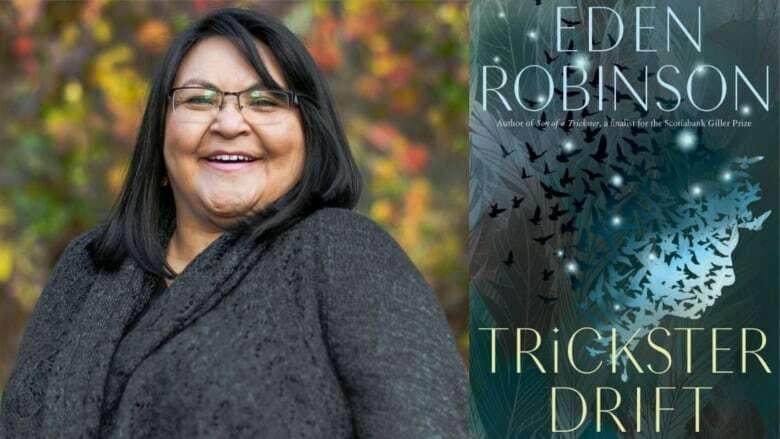 Haisla and Heilsuk author Eden Robinson talks about writing her second novel in a trilogy, Trickster Drift, and what she had to overcome to get here. Eden Robinson didn't mean to write a trilogy of novels about trickster, a figure found in many Indigenous mythologies. The Haisla and Heiltsuk author was actually writing "a trashy band council romance" when serendipity intervened. In her large family they would often sit around after supper and tell stories, many of them involving the "wild and funny" Haisla trickster figure Wee'git, when she noticed the young people were not laughing or getting the context. "So I wrote a short story putting Wee'git in a modern setting. Then about 50 pages in, I thought well maybe it's a novella. And then when I hit 400 pages, I guess it's a novel," said Robinson, bursting into laughter — a laugh she is known for. "I had a lot more to say about the son of Wee'git than I was expecting." The 400 page novel ultimately turned into a trilogy. In 2017, she published the first book, Son of a Trickster, a coming of age story about Jared, a teenager dealing with a broken family, peer pressure, drugs, alcohol and violence. To make matters even more complicated, Jared discovers his father is Wee'git, or trickster, and that his mother is a powerful witch. "Her gift is hexes. She doesn't really do a lot of hexes because if someone's annoyed her, she would rather throttle them. So her and Jared have this complicated relationship," said Robinson. The second novel, Trickster Drift, follows a now sober, 17-year-old Jared from Kitamaat to the big city of Vancouver, where he just wants to leave it all behind and go to school. But as the son of a trickster, magic and mayhem are never far away. "[Wee'git] has about 537 kids… give or take. And Jared is baby boy 321," Robinson explained. "He didn't show up in Jared's life in the hard periods, so when he finally does show up, Jared is not as grateful as Wee'git thinks he should be." While in the midst of writing the trilogy, Robinson faced personal loss and life changing challenges. Her father, Jonny Robinson, was diagnosed with Parkinson's Disease in 1998 and she moved home to Kitamaat Village to care for him in 2003. "In the morning, when dad was still healthy, he would come over and we would have coffee," she recalled. "After we had coffee we would go for a drive. So we would drive around and he would tell me stories. They are some of my favourite memories now." In fact, it was in part her father's humour and love of the supernatural that inspired Robinson to write them into her novels. He was especially fond of stories about B'gwus, or Sasquatch. Her father passed away October 2017, but Robinson found a way to honour him. In her final book in the trilogy, B'gwus will make an appearance. Earlier that year, Robinson was struck down with a mysterious illness. At first doctors thought it was fibromyalgia but it turned out to be polymyalgia rheumatica, an inflammatory disorder "usually seen in women in their 80s," said Robinson. The illness makes writing difficult — sometimes impossible — but Robinson said she's determined to work through the pain. When she gets really stiff, she writes in the chair lift she bought for her father. "It's just become one of my favourite places in my apartment," she said. Through it all, of course, she has maintained her sense of humour and focus. "I have a very obsessive personality. So once I get rolling on something, it's like a form of meditation," said Robinson. Robinson is working on the third instalment of the trilogy, to be titled The Return of the Trickster or The Trickster Returns. But when she wraps up the trilogy, she has plans of what she wants to get back to. "My trashy band council romance," she said with her famous laugh.